Dynamite Alarm Clock. I explode, I explode, I explode ... I exploits the clock. If you don't wake up with this clock, you are the king. This is how the dynamite alarm clock will make you jump out of bed. If you are one of the laziest and it costs you to get up, because you want 5 more minutes, I assure you it will take away the win with this alarm clock. The functions that have the alarm are setting time, alarm, snooze, light and alarm button to repeat. 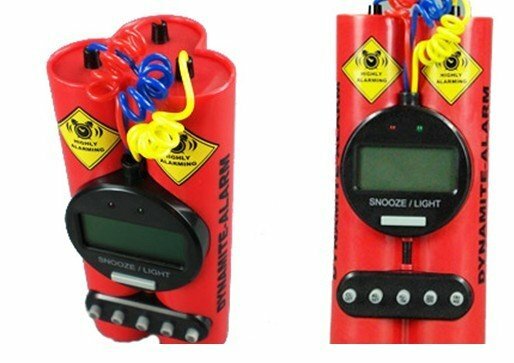 Dynamite Alarm Clock measures: 15 x 7 cm.